Here’s a wild combination of elements: art history, mystery, philosophy, and a clever beetle. Add in a plucky young boy of 11, divorced parents, and theft from a New York City art museum, and you have a ‘can’t miss’ children’s book. And this book definitely hits the mark on everything you want in a good children’s book – likable characters, a bad guy, no violence, deep insights, and a wonderful ending. You can tell by now that I loved this book from start to finish. I admit I had to get over the far-fetched idea of a beetle as a main character, but hey, that’s a small price to pay! The plot of the book involves several things at once – a somewhat sad boy that produces amazing drawings, though, like Rumplestiltskin, they are actually produced by someone else (the beetle). And then there’s art theft, with a surprising outcome, discovered by the beetle himself. So it’s all a bit of a wild imaginative ride. 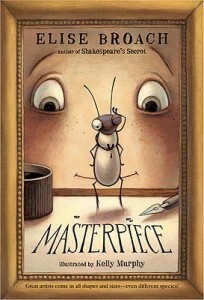 Yet, this children’s book gets grounded by very thoughtful observations about art, artists, virtues, and life itself. It asks deep questions about justice and compassion. This provides a nice tapestry as we go from the wild experience of an artistic beetle, to the more subdued thoughts of the adults. I wish the book was for all ages, but I think because of the depth of exploration about friendship and justice, it is best for 9 and up. Luckily for the younger readers, the author has started a children’s book series for 5 to 8, that I will also review. This one, meanwhile, can’t be beat.